After Apple introduced the new iPad Air 2 at its media event today, members of the press were invited to go hands-on with the new tablet. Several sites have now begun publishing their hands-on first impressions of the iPad Air 2, which we've gathered up below to provide an overall impression of the new device. TechCrunch says that although the iPad Air 2's resolution is the same as the iPad Air, the display looks better than the previous models. By combining screen components, Apple has made "things look a lot more touchable". The effect is similar to that of the iPhone 6 and iPhone 6 Plus, which makes the display seem like a "high resolution mock-up, rather than an actual display you can interact with and change." Gizmodo notes that Apple shaving off .04 pounds and 1.4 mm from iPad Air makes the iPad Air 2 feel lighter than the smaller iPad mini 3 even though it's a quarter of a pound heavier than Apple's new 7.9-inch tablet. 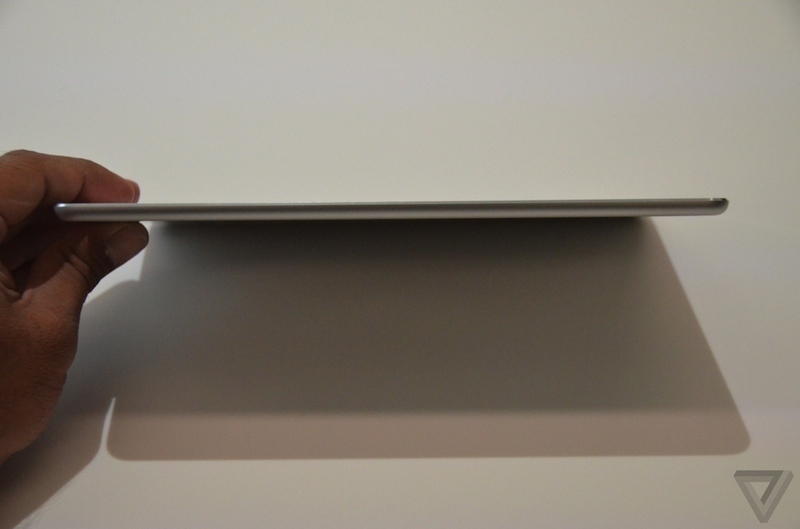 Not only is it way, way thinner than the smaller iPad mini 3 — and this will sound crazy — but it feels lighter too. Even though it's nearly a quarter of a pound heavier, the 6.1mm-thin chassis is so thin and easy to lift with a single hand that it makes the mini seem downright fat by comparison. I feel like I could hold it over my head in bed without any worry of smacking myself. Not something I can say about any other 10-inch tablet. The Verge has similar thoughts on the iPad Air 2's thinness, saying it feels like "there's almost nothing left to take away" and that holding the device is like "you're holding a screen and nothing more." The Verge also noted that the new 8 MP camera is much improved over the iPad Air. One thing is that is definitively better is the new camera, which is now 8 megapixels; it's a lot faster and shots seemed a lot clearer, at least in Apple's hectic demo room. Apple made a big deal out of this camera and the interesting apps people are building for the iPad that use the camera; we've fought it for years but tablet photography seems to be a thing now. 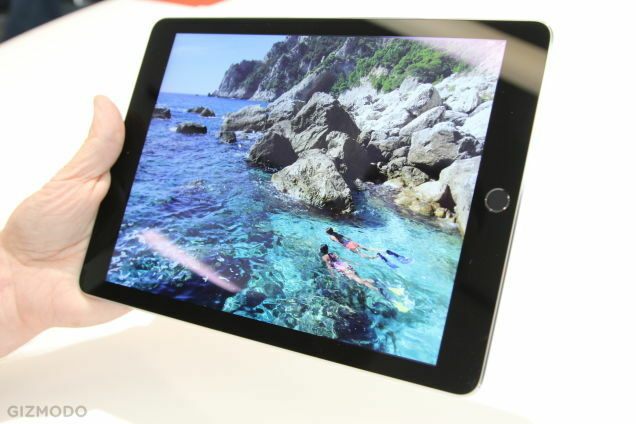 TechCrunch shares similar sentiments about the iPad Air 2's camera, noting that the camera improvements are good enough to make some consider the tablet as a worthy camera choice. The Verge also points out that the lack of a mute switch next to the volume rocker feels like a "casualty of thinness", and that although users can mute the device by holding down the volume-down button or lock the orientation in Control Center, the lack of the mute switch makes both things less convenient. Pre-orders for the new iPad Air 2 begin tomorrow, October 17, and will begin shipping next week. Prices for the iPad Air 2 begin at $499 for 16 GB with Wi-Fi. Why is the base only 16GB, it should be 32 by now. Apple totally neglected the iPad mini form factor. The new one has no A8 processor, no 8 mpx camera, is not thinner, not lighter. I bet it even has the same old screen. They added only Touch ID and gold color. It's really sad reading comments from bloggers like the Verge, Gizmodo and the like - even when the product is all that and a box of chocolates. I read them knowing nothing negative is going to be said or a backlash from apple will be imposed on them (no more invites, no more first looks and hand's ons). Really can't see this helping cure the reported market stagnation. Gave me no reason whatsoever to want to upgrade from my Air. Better camera, seriously? In 3+ years I've not used my rear camera for anything once. I don't speak for everyone obviously, but am I alone? Doesn't feel like it. No flash on the back camera? Then it's not improved. No, it should not be inferior. My old iPad 3 is still the best photo taking experience I ever had and my preferred camera for shooting everything. The camera in both iPads should be second to none. Still no flash (let alone TrueTone) in either iPad. Also no NFC. Yes, I want to use my iPad mini to buy things in stores. And if the damn thing has LTE, why not let me make calls? No wonder tablets don't sell as well, if they get crippled in so many ways compared to smartphones. OMG, I've heard about people like you, I just didn't know you existed. But how much RAM does it have? Good god, Apple NEVER MENTIONS IT. You'll know when someone opens it. Shouldn't be too long. Because they want to annoy people like me who get calls from their parents and grandparents wondering how they can clear off more space, and why the iOS 8 won't install. I even told them to get 32GB but people often buy what is cheap, not what they need. "You mean I went from a Dell laptop with a 120GB hard drive to an iPad with 16GB and I can't store all my photos?" Yep. At least now iCloud Drive will help with that, but then again older people fear the cloud and don't like paying monthly. At least the older people in my life don't.